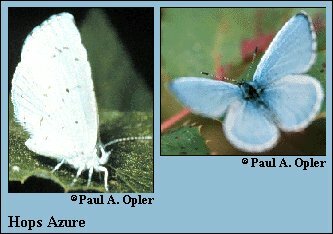 Identification: Upperside of male powdery blue. Female with extensive black and iridescent blue variably invaded by white scaling. Underside of hindwing mostly white with few black spots or none. Wing Span: 13/16 - 1 1/16 inches (2.1 - 2.9 cm). Life History: Caterpillars eat flowers. Flight: One flight from mid-June to early July just after flight of Spring Azure . Caterpillar Hosts: Hopes (Humulus japonica) and lupine in one drainage. Habitat: Mountain foothill canyons and ravines from about 5800-6500\', usually associated with patches of hops. Range: Colorado Front Range from Larimer County south to El Paso County. Conservation: Habitat may be threatened by the spread of alien weeds and resultant wildfires. Management Needs: Survey habitats and protect them from alteration and exotic plants.